One of the tenets of the Fluid-Mosaic membrane model is that the components of the bilayers are free to move. Before describing the differences between lipid and protein movement in the bilayer, it is important to consider the types of movement possible. Using a phospholipid as an example, the first type of movement is rotational. Here the phospholipid rotates on its axis to interact with its immediate neighbours. The second type of movement is lateral, where the phospholipid moves around in one leaflet. Finally, it is possible for phospholipids to move between both leaflets of the bilayer in transverse movement, in a “flip-flop” manner. 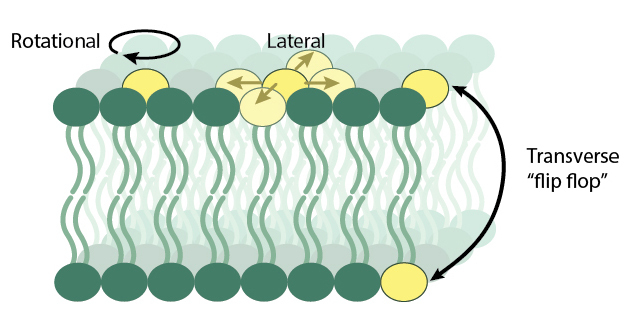 Phospholipids in the lipid bilayer can either move rotationally, laterally in one bilayer, or undergo transverse movement between bilayers. Lateral movement is what provides the membrane with a fluid structure. 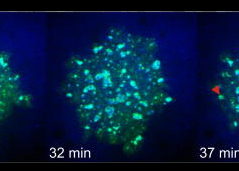 By labelling single particles and following their movement via high speed video, researchers were able to discover that phospholipids did not move via Brownian motion but rather by “hop diffusion”. Phospholipids stay in one region for a short while before hopping to another location. This compartmentalization of lateral movement appears to be linked to contacts between the actin cytoskeleton and the membrane which form the regions that the phospholipids hop between. As described above, membrane asymmetry is critical for membrane functions. Transverse movement is what allows the asymmetry to be maintained. Uncatalysed movement of phospholipids between the bilayers is possible, but this is slow and cannot be relied upon to maintain the asymmetry equilibrium. Instead, lipid translocator proteins catalyse phospholipid movement between the bilayers. Flippases move phospholipids from the outer leaflet to the inner leaflet. In order to maintain the charge gradient across the membrane, flippases predominantly transport phosphatidylserine and to a lesser extent phosphatidylethanolamine. Floppases move phospholipids in the opposite direction, particularly the choline derived phospholipids phospatidylcholine and sphingomyelin. Floppases also mediate cholesterol transport from the intracellular monolayer to the extracellular monolayer. These catalyzed movements are typically dependent on ATP hydrolysis. A third class of protein are the scramblases, which exchange phospholipids between the two leaflets in a calcium activated, ATP-independent process. In the case of membrane proteins, they are able to undergo rotational and lateral movement. However, there is no transverse movement of proteins between the leaflets. Intrinsic membrane proteins are tightly embedded in the hydrophobic core, whereas extrinsic membrane proteins associate with their required leaflet. The energy requirements to move either type of membrane protein across the bilayer would be excessive.